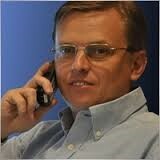 My name is Boris Fesenko. I am a software developer and the founder of BJF Trading Group Inc., a leading forex software company that is known to the majority of forex brokers. I am also a cofounder of two software companies that have created products such as Bridge, Multi-level IB, Social Trading Platform, PAMM, and many others. For years I’ve been working closely with forex traders, money managers and forex brokers. I hold graduate degrees in robotics and computer science, specializing in C++. I have published a number of articles in leading mathematics and forex trading journals. Since 2000 I have been developing robots and indicators for trading on the forex market. My team and I have developed more than 5,000 indicators and fully automated systems. We believe we can justly call ourselves pros when it comes to forex software. I have read countless books about forex trading, but the vast majority of them simply regurgitate information that has been easily accessible online for a long time now and that is also of very limited practical value. My dissatisfaction with the existing literature on the topic and my belief that forex traders are not getting the education that they deserve and need have provided the impetus for a book of my own. The objective of this cources is to give forex traders information that is truly unique, and to equip them with those tools and knowledge that are required to succeed in the forex trading business. My goal is to educate traders on how the forex market works from a technological perspective and on how to develop viable trading strategies that correspond to traders’ individual needs. Such introductions invariably begin by delving into a description of the forex market and its history. Just about every trader has read that the forex market is a billion-dollar juggernaut, that it has grown by leaps and bounds since its early days, and so on. This is all good and well, but how will this information help you as a trader? My approach to mentorship, training and education is radically different. Let’s take a look at the forex market from a technical side, first examining it from a trader’s vantage point. You are a trader and you have decided to open a position in a currency pair – say, by buying the EURUSD pair. You press a button, or perhaps your robot does it for you. What happens now? The order request is transmitted to the broker’s server and the “magic” begins. Practically just about every broker has an A-book and a B-book. 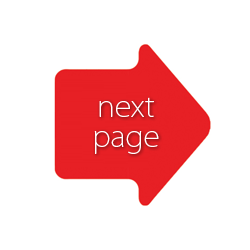 In the case of the A-book, your order is relayed to the aggregator* via the bridge**, from where it is sent to the liquidity provider that offers the best price at this point. The broker receives the price at which the order was executed and proceeds to open your order at that price – well, that price plus applicable commissions. 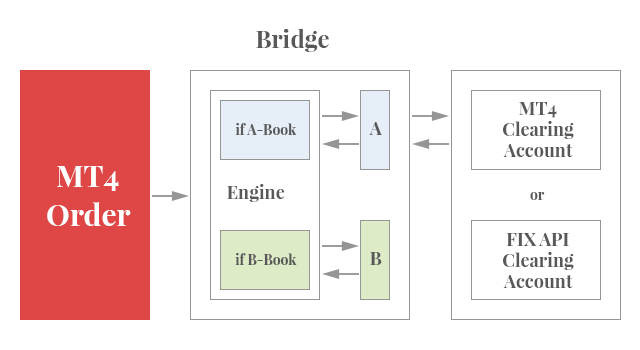 **-The bridge is a program that connects the broker’s server to the aggregator of a liquidity provider. *-The aggregator is a program that pools liquidity as supplied by several providers. In layman’s terms, this means that the aggregator chooses the best price among those offered by several liquidity providers. Naturally, the more liquidity providers there are, the better the spread for the broker and, most likely, for the trader. The sequence just discussed can actually be much longer. There may be several more intermediaries between the broker and the aggregator – intermediaries such as larger brokerage firms. A typical spread associated with the major currency pairs is between 0 and 0.4 pips. Brokers are frequently able to obtain a spread that is as low as -0.2 pips, but there are two reasons why your broker will be unlikely to pass on such a spread to you: the MT4 platform does not support negative spreads, and the broker is in business to make money. If your order goes to the broker’s B-Book, your order is filled by the broker and does not get sent anywhere. What is the difference between an A-book and a B-book from a trader’s perspective? At first glance, it may seem that the trader is better off when the B-book is used: the trader’s orders are filled quicker and there is no slippage*. Slippage occurs when an order is filled at a price that is different from the one asked by the trader. Slippage can be both positive and negative. Think of two rabbits, one in a cage and the other one out in the wilderness. The rabbit in the cage is always clean and fed. The one in the wilderness, on the other hand, is dirty and constantly needs to scavenge for food. But it is also free, unlike the encaged rabbit that has to live with the risk of being devoured once it becomes a little too well fed. Well, the broker’s B-book is like that cage – and you are the rabbit inside it. That is because your loss in the B-book is your broker’s gain, which makes it profitable for the broker to “help” you lose. This might seem straightforward. You select a currency pair, enter a buy order, wait for the currency purchased to rise in value, and then either sell it or (as is the case with MT4 brokers) close your long position. Or you sell a certain currency, wait until it falls, and close the position by buying it back. Very simple, isn’t it? The problem is that the majority of inexperienced traders quickly lose their deposits and, having been burned, never venture into forex trading again. A forex trader is a professional much like any other – say, an engineer. If you don’t have the necessary training, you will fail. I will try to describe all the tools that you need to trade successfully on the forex market. Only rigorous training and hard, painstaking work will groom you for success and ensure that you are able to sustain solid returns. Let’s talk about the kinds of brokers you will find in the jungle of the forex market. ECN brokers (Electronic Communication Network brokers) are among the brokers showing the fastest growth in the industry, and new ECN brokers have been proliferating. 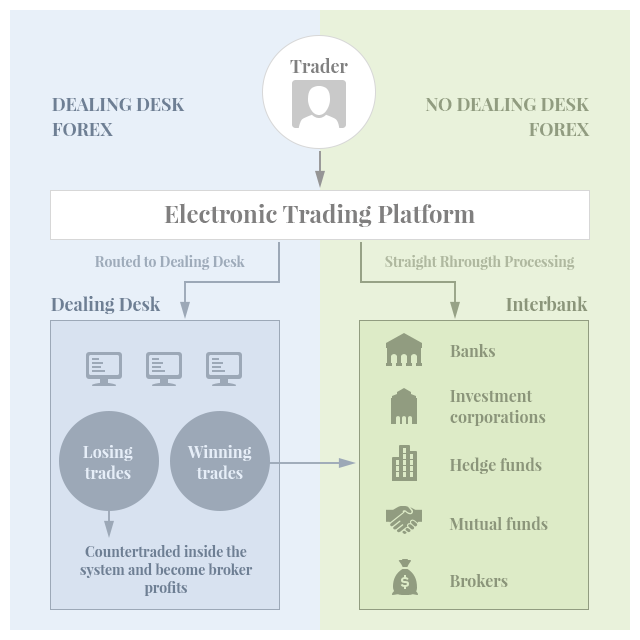 ECN brokers effectively function as intermediaries between market participants; they do not act as counterparties to traders’ orders, which has made the forex market more competitive. Many brokers refer to their accounts as ECN accounts, even though genuine ECN brokers are few in number and you need to have a lot of capital to open an account with such a broker. Bloomberg is one example of an ECN broker. Forex brokers are either straight-through processing brokers (STP brokers) or Electronic Communications Network brokers (ECN brokers). As has been mentioned, there is a tendency for many brokers to refer to their accounts as ECN accounts. As a matter of fact, the majority of broker accounts that are held to be ECN should actually be classified as STP accounts. Dealing-desk brokers are also market makers. Since dealing-desk brokers act as counterparties to orders placed by their clients, the possibility of a conflict of interest is introduced. I would say that 90% of brokers have a hybrid structure: an A-book (STP) and a B-book. How does a typical forex broker operate? First, all the small accounts are sent to the B-Book, while the large ones are assigned to the A-book. It is at the broker’s discretion whether an account is considered to be small or large, but usually the cutoff is $1,000-$3,000. Then, if a given account is losing money in the A-book, the account is switched to the B-book. The opposite is not always true: if an account is profitable in the B-book and its profits are a matter of several pips, the broker starts dealing against that account. For example, the broker increases execution time, adds drawdowns, etc. These measures are taken against scalping* and arbitrage* strategies. But if the strategy aims to make profits greater than 10 pips, the broker will have to switch the account to the A-book. A scalping strategy is a strategy that attempts to take small profits of 2-3 pips in a small amount of time, i.e., several seconds or minutes. An arbitrage strategy is a strategy that compares the feed of a slower broker with that of a faster broker, and opens orders with the slower broker when a price discrepancy is detected. I would like to discuss minimum lot sizes in greater detail. Usually, a liquidity provider accepts a minimum lot size of 0.1 and a step of 0.01. But brokers are interested in clients with small accounts, as these usually tend to lose money. For that reason, brokers offer a minimum lot size of 0.01, switching small-account clients to the B-book and offering trading terms that are worse than those in accounts with a minimum lot size of 0.1. There are liquidity providers that offer brokers a minimum lot size of 0.01 but, in 99% of all cases, the trading terms will still be more disadvantageous. That’s about all that you as a trader need to know about brokers. We can now discuss the process of broker selection. Your best bet is to open an account with a large broker that facilitates API trading (e.g., FIX API) and to use an automated trading strategy. We’ll get into that later. The minimum deposit for this kind of account is $10,000 and up. If you don’t plan on opening an account with $10,000 or more, you will need to choose a broker with ECN accounts that offers a small spread and charges small commission fees. Normal trading terms involve a spread as low as 0 and a commission fee of $6-8 per lot; the maximum leverage is 1:100. Things are more challenging for Americans. As regulation has pushed out healthy competition, it is difficult to find accounts that offer such terms for an American trader. Every trader should understand the types of orders available and which of those types are offered by the trader’s broker. It will help the trader select the appropriate order types for the trader’s strategies. Some brokers offer market orders only and do not allow traders to open limit orders. Or they may offer only a partial list of limit orders. If you plan on using an arbitrage system with FOK orders (to be explained later), your broker has to have FOK orders on the menu. Your choice of order type should be guided by your trading strategy and methodology. A market order is an order that is executed immediately at the prevailing market price. The prevailing market price is in essence the best price that is available right now for your order size. You should understand the risks inherent in placing such an order: if there is an adverse price move between the time you place the order based on the price on your screen and the time the order is executed, you will incur a paper loss, which would be a real loss if you were to close the position at this time. This adverse price move within a tiny time span is known as “slippage”. A price move in your favor might also happen, so slippage may not necessarily be detrimental to your transaction. A limit order is an order to buy or sell a given currency pair at a certain price or better. This type of order is used to enter or exit the market on your own price terms instead of depending on the vagaries of the forex market. A limit order to buy a currency pair instructs the broker to buy the pair at a rate below the current market rate or even lower than the specified rate, if possible. A limit order to sell a currency pair instructs the broker to sell the pair at a rate above the current market rate or even higher than the specified rate, if possible. A limit order that has been placed is always a pending order until the specified rate is reached. While the order is pending, it can be changed at any time. Once the specified rate is reached, the pending order becomes a market order and is treated accordingly. Your account balance changes only once the order is executed. A take-profit order is used if you want to capture a predetermined gain and exit the position to lock that gain. If you have a long position, your take-profit order will be to sell (close) the position at a price higher than the price at which you opened the order. Let’s say you are long EURUSD at 1.10. You can place a take-profit order with a price of 1.11. The order will be closed at 1.11 once that price is reached. Conversely, if you have a short position, your take-profit order will be to buy back (close) the position at a price lower than the price at which you opened the order. This type of order is useful when you want to open a position and walk away from the screen, without having to worry about watching the market all the time. Keep in mind that, when large fluctuations are experienced, slippage might occur (i.e. there might be a difference between the specified price and the price at which the order is executed). Stop-loss orders are used to try and cap potential losses when the market turns against your position. A stop-loss order closes your position once the specified rate is reached. If you are long, your stop-loss order will be to sell at a price lower than the prevailing market price. If you are short, your stop-loss order will be to buy at a price higher than the prevailing market price. Let’s say you are long EURUSD at 1.10. You place a stop-loss order to close the position at 1.075. If the market turns against your position and the US dollar rises to that level, the position will be closed. As with take-profit orders, you are vulnerable to slippage when the market is volatile. Stop-loss orders offer a way to help you limit your trading losses. Hidden stop-loss orders are orders that are not visible on the broker’s end. The price level of a hidden stop-loss order is stored in the robot’s settings; once it is reached, the robot sends a market order to close the position. There is one big drawback to this kind of order: there is a possibility of slippage and the broker’s filling the order at a different price. For that reason, although many trading strategies make the use of such orders possible, it is advisable to use a combination of visible stop-loss orders and hidden stop-loss orders. The above also applies to hidden take-profit orders. Trailing stop-loss orders are used to limit losses while taking advantage of any gains if the market price is favorable to your position. A trailing stop-loss order is set at a fixed number of pips away from the rate at which you opened the position. If the market moves against your position, the stop-loss order will become active once the stipulated pips distance is covered. If, on the other hand, the market heads in your direction, the trailing stop-loss moves along with the market and is adjusted accordingly. A trailing stop-loss on a long position will move up if the market price goes up and remain unchanged if the market price falls. Conversely, a trailing stop-loss on a short position will move down if the market price goes down and remain unchanged if the market price rises. MT4 (MetaTrader 4) is the most popular trading platform among traders. The platform comes with a number of advantages and many disadvantages. The main advantage of this platform is the ability to implement automated trading, which is based on a built-in programming language that is used in the creation of many robots and indicators. The main drawbacks include the slow and less-than-perfect flow of data between the MT4 terminal and the MT4 server; no terminal API, which limits the trader’s possibilities; and the wide scope of opportunities afforded to brokers to interfere and fully control traders’ activities. FIX API Trading. Black box. As I keep on rediscovering, many traders have at best a vague knowledge of what FIX API is all about. When testing a trading system, most traders tend to fall back on the following sequence: first, the system is tested in a demo account, then in a small account, and finally, if the system meets the trader’s expectations, the trader switches to bigger deposits. I often advise clients to try trading in FIX API accounts, but I tend to come up against the same reaction: instead of starting with a FIX API account right away, traders want to see how things go in a small account, switching to a FIX API account only if the results in the small account prove to be satisfactory. My company has sold scores of arbitrage systems. Surprisingly, just about every client who purchased one of our products chose to first install the product on the client’s PC with the intention to try trading on the PC before renting a virtual private server (VPS). This is the opposite of what a trader should do. To begin with, when using an MT4 broker, an account with $100 is in a different league than an account with $10,000. Therefore, you should test a one-hundred-dollar account only if you are going to be trading with more modest amounts (generally, under $500). If your deposit will be nearer $10,000, you should do your testing in an account that facilitate trading with that kind of money. Also, it doesn’t make much sense to test scalping or high-frequency systems on your home PC. You need a VPS, which should be located in the same data center as the server of your broker (in this context, I am referring to the main server and not the data centers that belong to MT4 brokers). Many traders tend to believe that FIX API accounts require high deposits and high commission fees. In fact, many brokers will open a FIX API account for you if your initial deposit is only $3,000-5,000. Even larger brokers will offer a FIX API account if you have $10,000 to invest. A VPS located in the same data center as your broker will set you back some $70 per month. What are the benefits of FIX API when compared with MT4 trading? What you see above is the optimal execution chain. The number of intermediaries between a trader and a liquidity provider can be larger. Since all of these intermediaries want to get a cut for their work, this will ultimately cost you. In the best-case scenario, this could be in the form of a markup. In the worst-case scenario, and as is so often the case with MT4 brokers, the dealer will see to it that your trading strategy goes bust. The FIX API protocol is much more effective than the MT4 one. An MT4 server processes client orders through a real-time queue. It follows that the more clients there are, the slower the processing time. When the market is active, this can result in slower execution. For example, when there is news and the number of orders swells, it will take longer for the broker to fill trades. Moreover, as the MT4 protocol is closed, software developers are unable to calibrate it and improve on it. By contrast, the FIX protocol is both open and well documented. Large volumes of data can be transmitted through the protocol without any significant impact on speed, which has made the FIX protocol a popular choice for many financial institutions. Existing financial platforms and interfaces fell short of traders’ expectations by making the simultaneous control of all the functions impossible. Existing interfaces posed a number of limitations – such as the requirement by many well-known platforms for a minimum of two ticks to fill an order, a requirement that is too slow for high-frequency strategies. Traders coveted safety and anonymity for their automated systems, neither one of which was previously offered. Traders were attracted to the ability offered by the FIX protocol to have a cross-connection with liquidity providers. The types of orders used in FIX API. A Good ’Till Canceled order, as the name suggests, is an order that remains valid until it is either filled or canceled. For those market centers that do not accept GTC orders, the order type is simulated by resubmitting the relevant order each business day upon opening of the market center. OPG - Use this type of order to send a Market-on-Open (MOO) or Limit-on-Open (LOO) order. IOC – an Immediate-or-Cancel order instructs the broker to cancel any part of the order that cannot be filled immediately. GTD – A Good-’Til-Date order remains valid until a specified date (i.e., until the market closes on that specified date). When you select GTD as the time in force, both an Exp. Date and Exp. Time field is displayed on the order management line. Enter the date up until which you want the order to continue to work in the format YYYYMMDD. To set a time, enter the time in the format HH:MM(:SS). If desired, enter a time zone using an accepted three-letter acronym. Note that if you do not enter a specific time zone, the time zone to which your computer is set will be used. FOK – A Fill-or-Kill order instructs the broker to kill the entire order if it cannot be filled immediately. DTC – A Day ’Till Cancelled order is an order that is deactivated at the end of the day, instead of being canceled or removed. Why aren’t other traders migrating over to FIX API? One of the reasons why the rest of traders have not yet moved over to FIX API is the persisting belief that brokers require initial deposits that are too high. However, as I’ve mentioned above, there are brokers that will accept initial deposits that are as low as $5,000 – without any discernible difference in the quality of execution and in quotes. Another reason holding traders back is the high number of expert advisors that have been accumulated by traders for analytical purposes on the MT4 platform. These advisors cannot be used in FIX API accounts. You can also use BJF FIX API Trader. There is an endless debate between traders who prefer to trade manually and those who use automated trading systems (robots). Personally, I am partial to robots. I’ll explain why. First, if a trader can come up with a list of firmly defined trading rules for his or her strategy, this strategy can be automated. A trader who is unable to come up with rules will most likely lose money. An automated strategy can be tested based on historical data to see its flaws and weak spots, which could be improved before starting to trade. Automated strategies can work twenty-four hours a day. An automated strategy will never have to worry about exhaustion and is immune to all sorts of human mistakes that happen due to one’s health, frame of mind, etc. In other words, an automated strategy will not make an error because it happens to be in a bad mood. Most importantly, there is nothing to prevent you from controlling your robot’s trading. MT4 is a good tool for developing strategies using the MQL4 programming language. The optimizer and tester built into the MT4 platform will help you optimize all the parameters and test the strategy using historical data. At this point, I recommend that you download the MT4 platform, if you don’t yet have it. Then you can open a demo account and get acquainted with the platform. 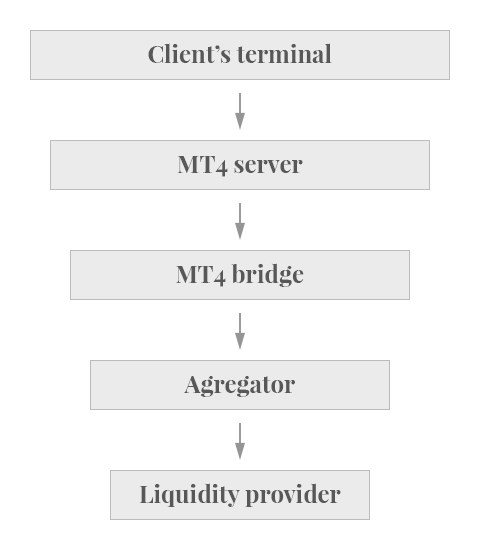 If you have purchased or developed a trading strategy using the MQL4 programming language for an MT4 terminal, you can test it immediately based on historical data and even optimize all the external parameters. Usually, optimization is done for stop-loss and take-profit levels, indicator parameters used in the trading system, trading time, etc. Optimize and test the strategy using quotes provided the broker with which you either have an existing account or plan on opening one. Do not use quotes from other brokers for your testing. Choose a time frame for your optimization as well as one for your testing, and be sure that the two time frames that you choose are different and do not coincide. Compare the optimization results to those obtained from your testing. It is unnecessary to dwell on the topic of testing and optimization, as most of the information about this is widely accessible and can be easily located. First of all, what is technical analysis in the forex market? Technical analysis is used to study the dynamics of the market in the past, as well as its present state and trends, with a view to forecast future performance and prices. Many indicators were developed by traders to perform technical analysis, and your MT4 terminal should display all the major ones. Many traders believe that an indicator is a little arrow on a chart that tells you when you should enter or exit a position. That is a misconception. For example, the divergence indicator only shows the area of divergence and nothing else. It’s up to the trader to build a trading strategy based on a given indicator or on a combination of several indicators. Usually, if you buy an indicator and the retailer promises you that you will almost always be profitable if all the arrows are followed, the trading strategy is said to be partially automated. The thing to do is to fully automate that strategy and test it based on historical data. But I digress. So what is an indicator? Broadly speaking, there are two groups of indicators: trend indicators and oscillating indicators. Trend indicators allow you to follow market trends. Trend indicators include Moving Averages, Bollinger Bands, Parabolic SAR, and others. Naturally, the best entry point into the market when trading on trends is the beginning of a trend, when the new trend is just emerging. But almost all indicators lag trends, which makes it hard for traders to take advantage of a new trend at the very beginning and to ride the trend until a second wave. The main signals given by trend indicators in the forex market are a turnaround or a crossing of the indicator with the price chart or some other indicator. When such signals are produced, the trader can open or close a position or readjust a stop-loss order. The main signals produced by oscillators to suggest whether the time is ripe to open or close positions is a crossing of the overbought and oversold levels, or of the zero line, and a turnaround in these areas. In my view, divergence is a very strong signal in the forex market. As it is essential for traders to interpret signals accurately, this deserves further elaboration. What is divergence? Divergence occurs when the price of a security moves in the opposite direction (i.e. diverges) from an indicator, so analyzing divergence involves comparing the price of an asset to a number of technical indicators. Divergence can signal a continuation of the existing trend, an imminent change in that trend, or the development of a new trend. This should be your cue to monitor the market and be prepared to open orders in the direction of the signal. Signals should be backed up by price behavior as well. There are a number of gauges that can help you determine if the price confirms the signals. For example, the price may show a higher maximum/minimum or a lower maximum/minimum; the price may breach the last swing maximum/minimum; or the price might break through the maximum/minimum of a previous bar. You may find that many of these confirmations will correspond to the MACD histogram’s crossing zero. A number of indicators can be used for divergence trading: the MACD, stochastic, RSI, CCI, etc. As with most indicators, divergence signals in a higher timeframe will indicate a more significant price movement. The examples belowcompare the price with the MACD and stochastic indicators. Each chart shows the 50-period exponential moving average (in blue), the 200-period EMA (in red), the stochastic with the periods 9/3/3, and the MACD-histogram with the parameters 7/10/5. 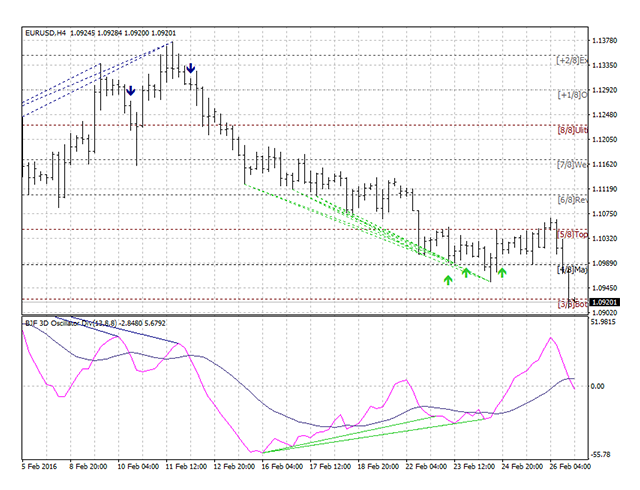 There are many other parameters for the MACD and stochastic that also work successfully for divergence signals. Regular divergence (RD) is ideal for testing previous maximums or minimums. Most traders refer to it as double or triple top (or bottoms). It is often possible to see 3-4 higher price maximums during an ascending trend with 3-4 lower indicator maximums or, conversely, 3-4 lower price minimums during a descending trend with 3-4 higher indicator minimums. This is known as third and fourth regular divergence. The indicator effectively tells you that the trend is weakening and a change in the trend might be looming. This is your cue to adjust your trading accordingly, e.g. to move your stop orders closer or to take money off the table. I’d also like to explore the concept of hidden divergence. Hidden divergence (HD) is used during the development of a new trend in the direction of the emerging trend. Usually, the price should, at a minimum, move towards the last swing maximum or minimum, which makes it possible to calculate the risk-profit ratio to see if a trade makes sense. If sufficient movement is not possible between the signal reception point and the last swing maximum or minimum, trading is typically avoided. Trading is also avoided if hidden divergence is detected for the last third maximum during an ascending trade or the last third minimum during a descending one. This signals a potential change in the existing trend. A lot of traders ask me for advice on a divergence indicator that has an 80-90% accuracy rate with respect to entering and exiting the market. This approach is flawed. I will explain why that is so by using the following example of a divergence indicator. In the illustration above, you can see the up and down arrows. These are not buy (in green) and sell (in blue) signals. These are divergence signals between the price and the 3DO indicator. A divergence indicator should only show divergence. It is up to the trader to come up with a trading strategy based on the indicator(s) used. A trading strategy is a set of rules that govern the way you open or close a position, set stop-loss and take-profit orders, etc. These rules might also define the number of open orders you are willing to have at any given time, and so on. Let’s attempt to develop our own trading strategy based on the divergence indicator i-3DO-Div3.mq4. The entry and exit points, the level at which you set your stop-loss and take-profit orders, will be determined with the help of the Murrey Math Line X indicator. The Murrey Math Line X is a pivot line indicator that should help any trader who has experience trading with support, resistance and pivot lines. It displays eight different lines – though it could potentially display more –on the main chart, helping you find the best entry and exit points, and the best time to buy or sell. You can download this indicator for the MT4 and MT5 platforms. P (default = 64) — the period in bars or in other periods (set by MMPeriod), on which the lines will be calculated. The lower the number, the more current but less accurate the calculations will be. MMPeriod (default = 1440) — this is a basic period expressed in minutes (60 for hourly pivots, 1440 for daily pivots, 10080 for weekly pivots, and 43200 for monthly pivots); if the value is greater than zero, the indicator will use the P amount of MMPeriod minutes to calculate its lines. If the value is zero, the indicator will use the P amount of the current chart bars to calculate its lines. StepBack (default = 0) — this is a shift back for calculating the lines (expressed in the current bars, or in the number of MMPeriod,if set in minutes). Other parameters — these affect only the visual parameters of the lines. It's easy to use the Murrey Math Line X. 0/8P and 8/8P lines are the ultimate resistance and support lines — they are very hard to break. 1/8P and 7/8P lines are weak support and resistance lines, but if the price stops near them, it will reverse itself, changing direction. 2/8P and 6/8P lines are strong reverse points. 3/8P and 5/8P are the bottom and top of the average trading range, respectively; it is very likely that the price will either quickly break through this range or remain inside it for a long time. 4/8P is a major support and resistance line; you should sell and buy when the price crosses this level and the profit objective has been fulfilled. The blue arrow marks the final calculated bar. As you can see, the blue arrow (the first one on the left) is pointing down, which is a divergence signal suggesting that selling is timely. The signal is issued when the price approaches line 2/8P, which is a “hard” line and may serve as a reference point for a pending order to sell. If the price does not stop before line 1/8, we can hold an existing position. When the price reaches line 8/8, we close the position. With the appearance of the first green arrow, we place a pending order to buy at the 4/8 level and close the position at 5/8.